We have a robust system for assessing risks from pesticides, which shows neonicotinoids are not an unacceptable risk when used correctly. Current information on this topic is available on our pesticides page. The myth - The Independent claims that the finding of an unpublished US scientific report suggests neonicotinoid pesticides could be killing bee colonies across the world. The truth - The finding of the US report is not unexpected - that if a bee is given a dose of insecticide and an infection it will become weaker as a result. 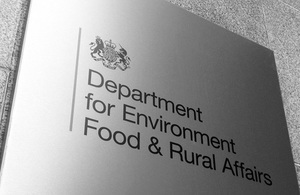 The UK has a robust system for assessing risks from pesticides and all the evidence shows neonicotinoids do not pose an unacceptable risk when products are used correctly. However, we will not hesitate to act if presented with any new evidence. Since 2008, we have contributed more than £5million to projects on honey bee health, including research and beekeeper training. The Government’s National Bee Unit helps beekeepers prevent disease and its scientists recently discovered a potential new way to fight the varroa mite.